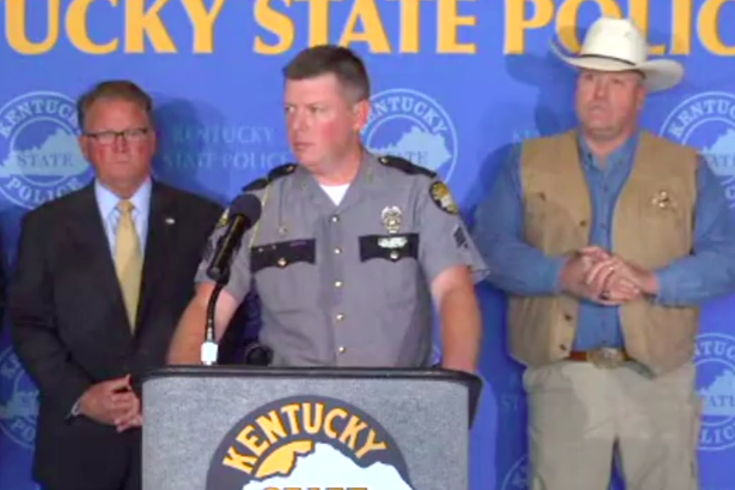 Kentucky State Police hold press conference on arrest of Dylan Jarrell, 21, of Lawrenceburg. A South Jersey woman who alerted authorities after she was the target of racial insults on Facebook may have prevented a school shooting in Kentucky. Koeberle Bull of Lumberton, Burlington County, logged in to Facebook recently to find disparaging messages in her inbox from a Kentucky man identified as 21-year-old Dylan Jarrell, according to FOX News. The messages reportedly denied the existence of white privilege and wished death upon Bull's three children, who are biracial. Bull noticed that Jarrell's profile picture showed him holding a weapon. She contacted Kentucky State Police to file a complaint. An investigation led state police to the Lawrenceburg area, west of Lexington, to confront Jarrell, who was reportedly found pulling out of his driveway last Thursday with a gun and a large cache of ammunition. At a press conference, state police said Jarrell was in possession of a firearm, more than 200 rounds of ammunition, a Kevlar vest, a 100-round magazine and a detailed plan of attack. Authorities believe an attack may have been intended for two schools in the Lexington area. "I'm not a guardian angel. I’m not a hero. I’m a mom," Bull told FOX29. Jarrell reportedly pleaded guilty to making terroristic threats and sending harassing communications.